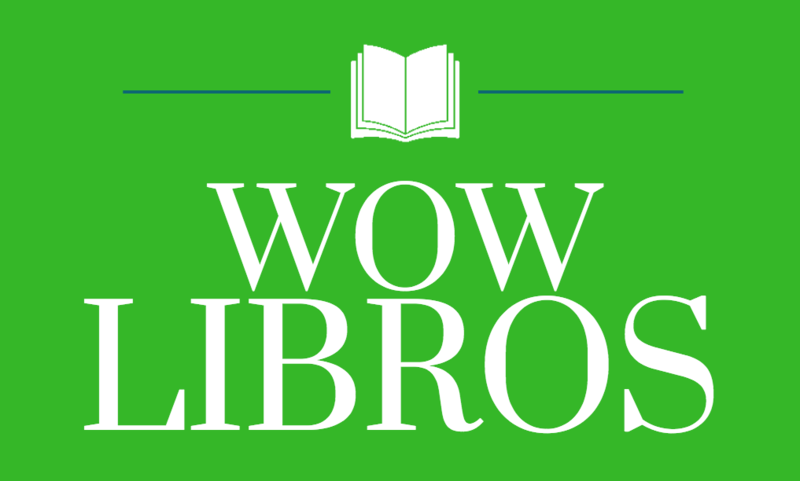 For news straight from WOW, read our press releases or find us on Facebook, Twitter, Instagram, LinkedIn, Pinterest, or Litsy (@WOW_Reads). 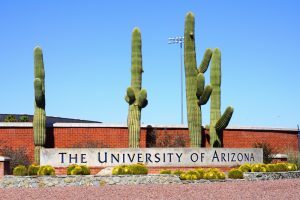 UofA Alumni Association: WOW, What a Legacy! In January, Jerry and Kathy Short were vacationing in Hawaii when their cellphones displayed this message: Emergency Alert: BALLISTIC MISSILE THREAT INBOUND TO HAWAII. SEEK IMMEDIATE SHELTER. THIS IS NOT A DRILL. “We followed the masses into a hotel cafeteria, which was like a bunker. People really panicked. They were crying and calling their loved ones to say goodbye,” says Jerry Short. A second message came through 38 minutes later identifying the alert as a false alarm. The Shorts decided that day to make some decisions about their charitable giving. 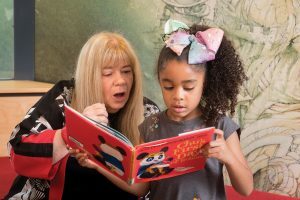 The nation’s largest collection of children’s and teen global literature has received a $1 million endowment to support future teaching and scholarship. 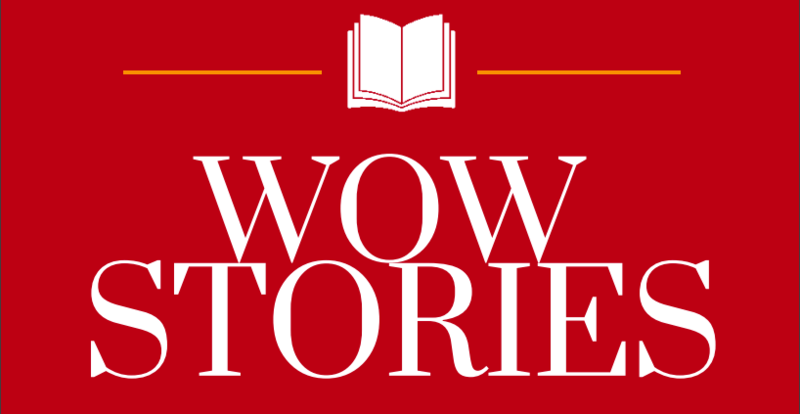 A $1 million gift has been made to the University of Arizona to support Worlds of Words. The gift was made by the collection’s director, Kathy G. Short, and her husband, Jerry Short, who wanted to endow the director’s position in order to ensure that Short’s successors are leading scholars who can further advance the collection. Teachers are always searching for new ways to challenge students to explore their own lives and the diversity of cultural communities that enrich us. Looking to “global literature” – books from diverse cultures around the world — provides an opportunity for students to go beyond a tourist perspective of only gaining surface-level information about a culture. 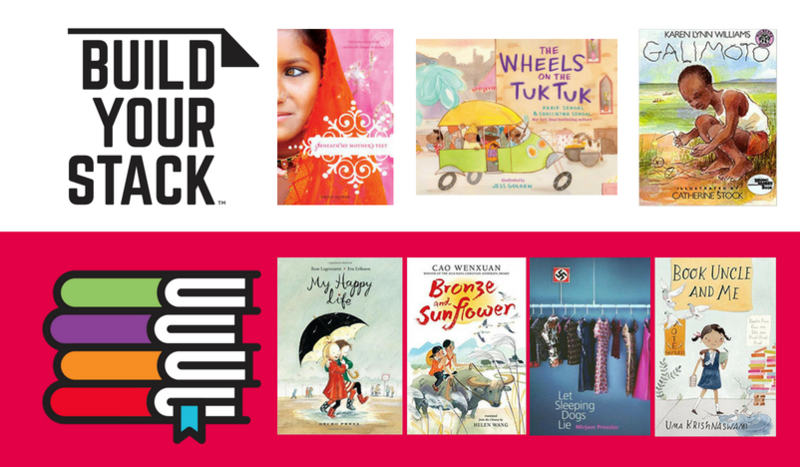 Worlds of Words (WOW) has created global book lists that pair classic children’s and young adult literature with global books that reflect the cultural diversity of our students and our world. 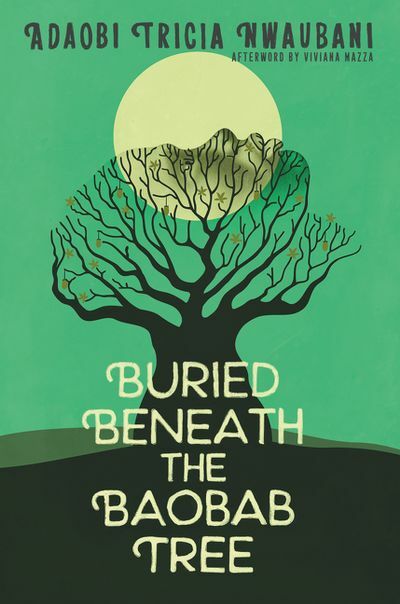 These fiction and informational books, organized by grade level, can support librarians’ global collection development as well as provide critically reviewed texts that can be integrated into the curriculum. This year I have enjoyed serving on the Astrid Lindgren Memorial Book Award Committee with USBBY, the United States Board on Books for Young People. Our chair, Dr. Kathy Short, is a professor at the University of Arizona, College of Education in Tucson. She is the Director of an exciting project called Worlds of Words. The Hello, Dear Enemy! 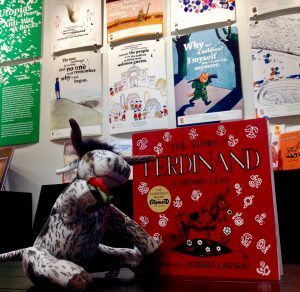 exhibit at Worlds of Words provides the perfect setting to learn more about Ferdinand and books like it: stories that remind us of how powerful each of us can be in the face of opposition and darkness. Worlds of Words is the first stop for this traveling exhibit, so be sure to stop by before it ships out! Bravo to Worlds of Words for adding a world language section. The research center received donations of 1,000 books from students, faculty and other supporters within the community. 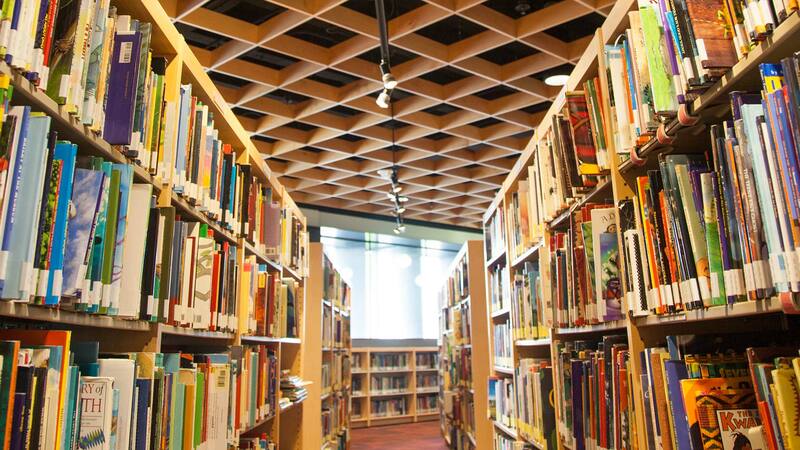 Worlds of Words in the University of Arizona’s College of Education has added a World Language collection with more than 1,000 donated texts to its main collection of 36,000 global books. Most of the newly donated books have been provided by students, faculty members and other friends of the collection. And of the new donations, more than 300 books in Russian came directly from UA faculty members Brenda Frye and Sergey Cherkis. 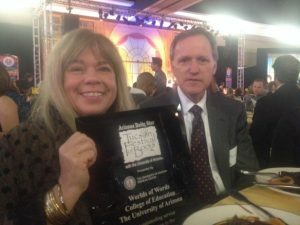 As Collections and Outreach coordinator at Worlds of Words, Ballenger organizes materials, events and exhibits at the extensive global literature resource center housed in the UA Education building in order to connect the Tucson community with their exclusive collection of global children’s books and artwork. 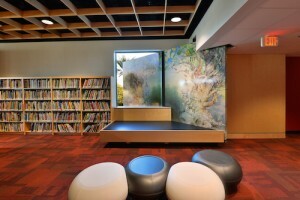 Nestled on the fourth floor of the education building at the UA, the newly renovated Worlds of Words center houses one of the largest collection of global children and adolescent books in the United States. It also hosts many artists and scholars in residence. “Four Questions” is an occasional feature in which UANews asks experts from the UA for their perspective on current events or pop culture. WOW Director Kathy Short answered questions about teaching adults as well as children and adolescents about global citizenship through reading. 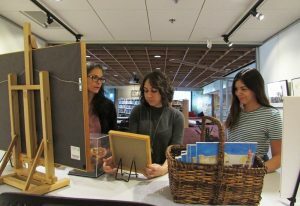 The UA’s College of Education Worlds of Words has nearly 100 pieces of original art in the collection, about half of which are on public display in the studio, main space and Mary J. Wong/Grace Lin collections. In a collection already bursting with important works by children’s book illustrators, Worlds of Words added one more. 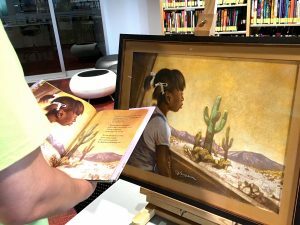 The untitled piece from “In the Land of Milk and Honey” by award-winning illustrator Floyd Cooper recently went on display in the University of Arizona collection, housed in the College of Education. 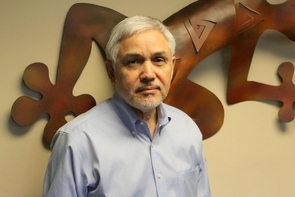 The College of Education’s Worlds of Words, in collaboration with Resplandor International, is expanding in Mexico, launching a visiting scholar program in honor of the late Richard Ruiz — and growing its library. Roughly 10 miles outside of Guanajuato, Mexico, sits the home base for Resplandor International, a nonprofit humanitarian organization founded with a desire by those at the University of Arizona to enrich cross-border cultural competency and promote economic development through education. 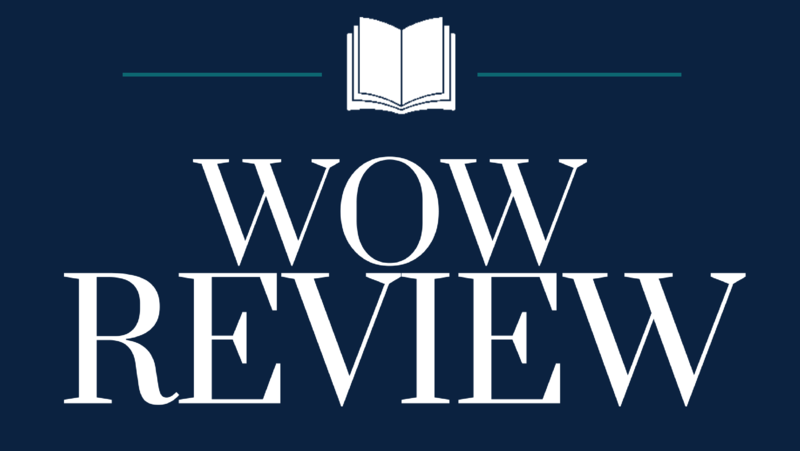 What is TFOB and WOW? Tucson Festival of Books and Worlds of Words. Both are located at the University of Arizona. The Tucson Festival of Books is a weekend of author spotlights and presentations, kids’ activities, book vendors and displays, top notch entertainment, Science City and much more! In addition to all the festival activities, I had the opportunity to tour the newly remodeled Worlds of Words in the College of Education at the U of A.
Dear Reader, I just had the most incredible weekend. I went to the Tucson Festival of Books (a k a @TFOB). When you’re an author, you must go to this. Kathy Short is a super-duper VIP in the world of children’s lit. So you can imagine my surprise to find myself seated at her table. And you can imagine my further surprise when the MC mentioned my name as an example of the authors Kathy brought to this year’s festival. Really? Me? 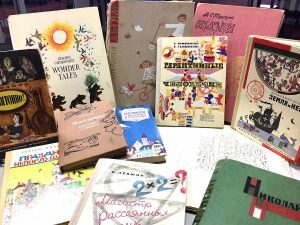 During the celebration at the UA College of Education, Finland’s ambassador to the United States, Ritva Koukka-Ronde, will award a Finnish language and culture book kit to Worlds of Words, a collection of international children’s and adolescent literature. 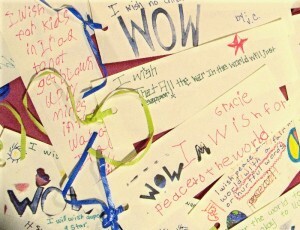 The Worlds of Words website provides many useful resources for building bridges between cultures. 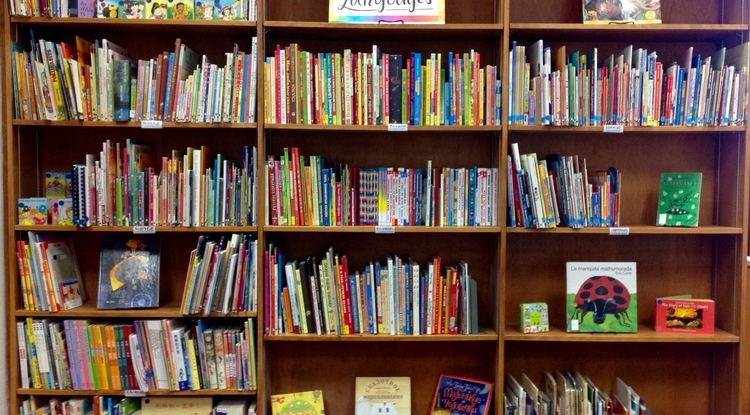 These resources include multiple strategies for locating and evaluating culturally authentic international children’s and adolescent literature as well as ways of engaging students with these books in classrooms and libraries. Critical annotations are available and can be sorted by geographic region, age or region. WOW! I would love my 5 year old to participate in these wonderful literature activities, however we do not live in Arizona! This sounds like an enjoyable learning opportunity for any parent, teacher, and child. Thank you for putting together these fantasitic literature events for children of the world. This sounds like an exciting event. So, children from what age group and up are able to attend? Is this event to children from preschool age and up?